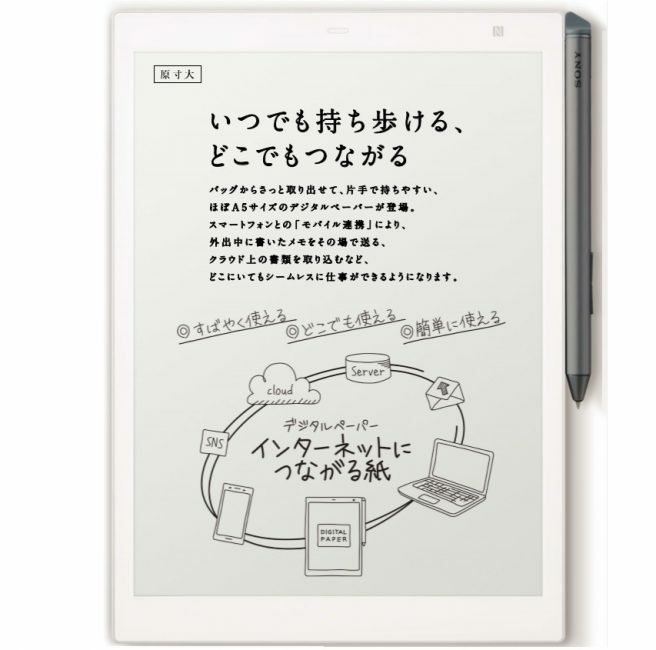 Sony announced a third Digital Paper “eWriter” in Japan this morning with the 10.3-inch Sony Digital Paper (DPT-CP1 (1804)) which is super thin at 5.9mm, and ultra light at just 240 grams. It will be on exhibitions in May and will be launched in June, likely in the $500 to $600 region. At 10.3 inches it is significantly smaller than the current 13.3-inch DPT-RP1 and DPTS1. The Sony DPT-RP1 was also launched in June last year, so it seems to be a seasonal timing. The 10.3-inch screen size is called similar to the A5 paper format, with the screen resolution being 1872 x 1404. The processor is a quad-core Marvell IAP140 because nothing more is needed, other than to have a processor that is quick to respond and that saves battery. Built-in storage is 16GB, but it has many settings for cloud storage syncing, which is where most of the storing of materials will be made by the majority of users. And it also has wide support for Windows, Mac, iOS, and Android, with Digital Paper apps for all these operating systems. This makes sharing documents either with other people or with one of your own devices very easy and quick, because Sony has gone to lengths to ensure that this process is seamless and quick, with support for NFC, full Wi-Fi cover, many email and uploading features, in addition to the intuitive cloud syncing. Battery life is good, which by the eWriter battery life standard is a solid 3 weeks. 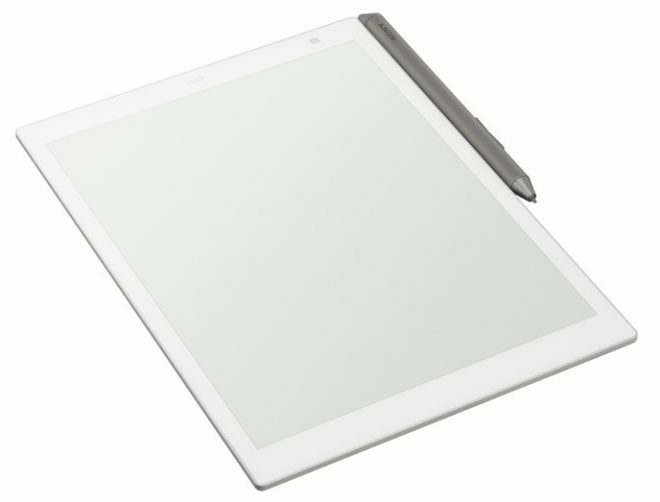 The stylus for this Digital Paper tablet is the Sony DPTA-RS1 Digital Paper Stylus, which is the same digitizer compatible with Sony’s other eWriters. This is a 10.4mm wide micro-USB rechargable pen with a 1 month battery life, that can be charged from the rear. It has a shark fin that can be used to clip it to the tablet. And there’s also a tablet cover made by Sony for their new Digital Paper tablet.